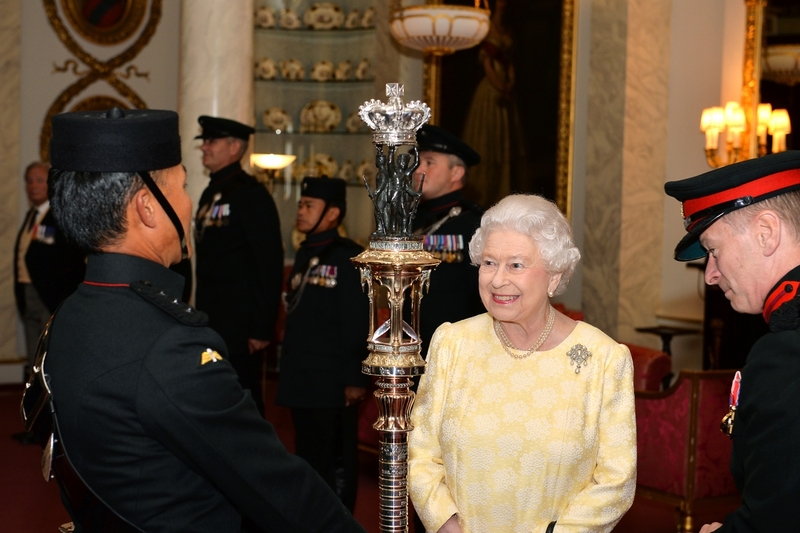 The Queen’s Truncheon was presented to Her Majesty, Queen Elizabeth II, at Buckingham Palace as part Gurkha 200 celebrations on Wednesday 10 June 2015. The Truncheon Party was led by the Truncheon Jemadar, Captain Dillikumar Rai, who was joined in the Buckingham Palace Bow Room by Colonel James Robinson ,Colonel of the Brigade of Gurkhas and Deputy Colonel of the Royal Gurkha Rifles, the Commanding Officers and Gurkha Majors of 1RGR and 2RGR as well as two members of the 2nd Goorkha Rifles Regimental Association, Lieutenant General Sir Peter Duffell KCB CBE MC and Brigadier Bruce Jackman OBE MC. Images of Her Majesty Courtesy of the Press Association. All other images Crown Copyright. Colonel Robinson accompanied Her Majesty and explained the history and significance of the Truncheon and indicated where a new ring had been added denoting the date of the latest presentation. His Royal Highness, The Prince of Wales, Colonel-in-Chief of the Royal Gurkha Rifles, was also in attendance and went on to have a private meeting with the Gurkha soldiers after the initial ceremony while Captain Dilli and Colonel Robinson were also interviewed for a documentary about Her Majesty The Queen. This was the sixth time the Truncheon has been presented to Her Majesty, who first requested to see it shortly after her Coronation in 1953. The history of the Truncheon stems back to when the Sirmoor Battalion was awarded an honourary colour for their bravery and service at the Siege of Delhi in 1857. When the Sirmoors became a rifle regiment however, the colour was replaced by a Truncheon as rifle regiments did not carry colours at the time. When the Royal Gurkha Rifles were formed out of 2, 6, 7 and 10 Gurkha Rifles in 1994 they took over the honour of keeping the Truncheon which now resides in Shorncliffe with the UK Royal Gurkha Rifles battalion. More information on the Truncheon and its history is on the Gurkha Museum website.